Everyone of us can remember a really positive first impression that we have had of someone as well as a really negative or bad first impression that we have had of someone. What made it so positive? What made it so negative? First impressions matter, a lot, yet it is so easy to lose sight of how important our actions are right from the start with those we lead and interact with daily. In education, we have the opportunity everyday to make a positive first impression, not only to start the day, but many times hour to hour with different students coming and going from passing periods. Common sense tells us that first impressions matter because of our own experiences, but research also backs up how important they are. Research shows, in fact, that first impressions have been shown to last for months (Gunaydin, Selcuk, & Zayas, 2017) and impact personal judgments even in the presence of contradictory evidence about the individual. (e.g. Rydell & McConnell, 2006) As educators this matters. As months easily become a large part of a semester and even year with a student. If we don’t get the first impression right, it would be very easy to lose that student from the very beginning of the year. As one of our CharacterStrong presenters and outstanding high school educator Bryan Slater always says, “It is hard for a student to learn from someone that they don’t like.” Right behind that he also says, “It is hard for a student to learn from someone they feel does not like them!” Those statements are so true. The scary thing is that I have known many solid leaders who have a great heart for those they serve, but people think that they are always mad or angry simply because of the non-verbals that they display. So many times these non-verbals are the first impression that colleagues and students see. What would someone see if they approached you for the first time? How long does it take to make a first impression? In Eric Wargo’s Association for Psychological Science article titled, How Many Seconds to Make a First Impression? He speaks of a series of experiments by Princeton psychologists Janine Willis and Alexander Todorov that reveal that it takes only a tenth of a second for someone to form a first impression of a stranger simply from their face. The experiments also showed that longer exposures to someone doesn’t significantly alter those first impressions, however it may boost your confidence in your previous judgements of that person. Given this information, schools would be very wise to take a deep look at reflecting on and committing as a staff to some keystone habits to make a positive first impression with their students, not only at the beginning of the year, but day in and day out. Not only do the first minutes and seconds matter, but tenths of a second. Did you have a warm expression on your face that extended a welcome feel? Did they see you looking to connect? Were you starting to say their name as they approached you or ask their name if you did not. How could you be more intentional with that first tenth of second starting today? What can teachers do to start intentionally this school year? At CharacterStrong we have created a 40 Week Staff CharacterDare that schools can use to remind their staff members of different ways that they can infuse strong relational and leadership practices into the daily fabric of their classrooms, hallways, and even the staff lounge. We presented this tool at the National Principals Conference in Chicago in July and many administrators were asking how they could implement this into their schools. You can implement it with your staff by ordering the CharacterStrong Gym and we will also be sharing some out each week to our blog subscribers. Here are two example Staff CharacterDares that could help you start with a solid first impression this year. To start the year, give each student (or a parent if it is a younger student) a notecard and ask them to write out their name phonetically and turn it back into you. 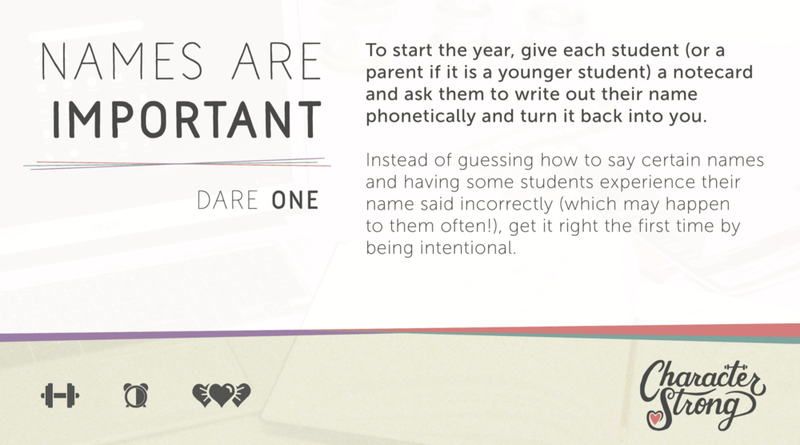 Instead of guessing how to say certain names and having some students experience their name said incorrectly, which may happen to them often, get it right the first time by being intentional. Sometimes it is not that the student’s name is even hard to pronounce, but maybe they go by something different than what their name says on the roster. One of my good friends goes by their middle name and I never knew it until I saw his name down on a roster and it wasn’t what I was used to seeing. Remember that names are the beginning of a relationship. What kind of impression does it make when you take that first step that tells them that they matter? Take your class roster(s) and highlight the 3-5 names of students you feel could use some unconditional love and support early on in the year or semester. 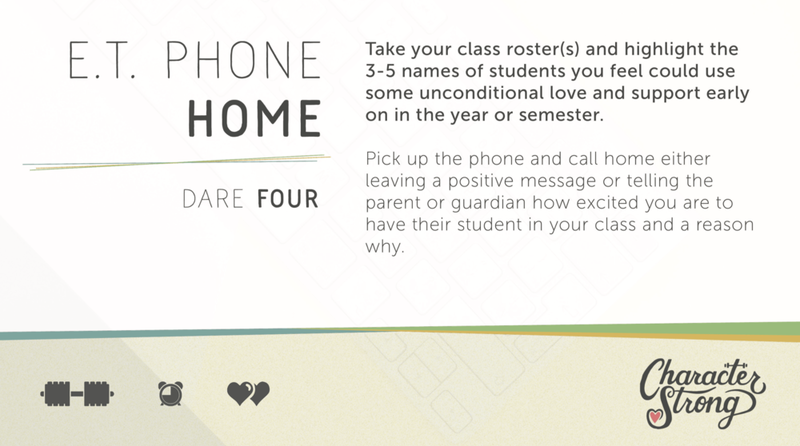 Pick up the phone and call home either leaving a positive message or telling the parent or guardian how excited you are to have their student in your class and a reason why. Making phone calls can seem like a daunting task, but think about the power of that 3-5 minutes when you flip the script on what someone thinks is coming when they answer to hear the teacher’s name on the other end, and instead of hearing something negative they actually receive a compliment! I still remember the time when a new colleague of mine approached me and said, “You don’t remember me do you? About 7 years ago my daughter was in your 9th grade class and you called me during the school year to compliment me on raising such a wonderful daughter and gave me specific reasons why. When we hung up I cried for thirty minutes straight. My daughter was not the top student in the school, and she also was a student who never got in trouble, she was just right in the middle. Did you know that was the first phone call that I had ever received from a school about my daughter?” I have never forgotten those words. Not only are our positive phone calls home powerful seeds planted for a student who we know might be a bit more difficult during the year, but also for our students who show up every single day, do the work, and then go home and repeat again the next day. Let’s not forget to make time to acknowledge and start the year off on a great first impression with them either. Best wishes for a great start to the school year! Gunaydin, G., Selcuk, E., & Zayas, V. (2017). Impressions based on a portrait predict, 1-month later, impressions following a live interaction. Social Psychological and Personality Science, 8, 36–44. Rydell, R. J., & McConnell, A. R. (2006). Understanding implicit and explicit attitude change: A systems of reasoning analysis. Journal of Personality and Social Psychology, 91, 995–1008. About the Author: John is a co-founder of CharacterStrong, a Servant Leadership trainer, and motivational speaker. He was Washington Advisor of the Year and taught 5 leadership classes per semester for 10 years at Sumner High School and was a Program Administrator for the Whole Child for five years.